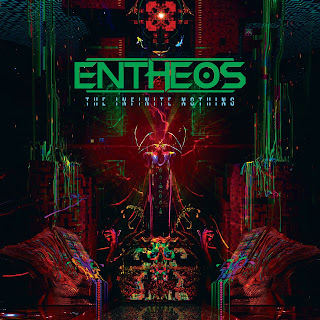 The Infinite Nothing is the debut album from progressive death metal band Entheos. Birthed from former members of various other bands, this is one of the most original and exciting death albums of the year. The music is complex and full tempo changes, but it never comes off as boring or pretentious. Instead there is a feeling of a continuous attack of technically superior death metal. Everyone in this band just exceeds at being extremely proficient and talented in their respective roles. Frank Costa's soaring and ripping guitars give a deep and wondrous variety to their sound. While the pounding drum and bass, by Navene Koperweis and Evan Brewer, receptively, make for a driving and thundering force. They are accompanied by the brutal vocals of Chaney Crabb. She sounds vicious but still manages to keep a feel that goes perfectly with the accompanying music. To only say she is one of the best female vocalists in extreme metal would be an understatement. This all adds to give birth to music that goes from pounding, to fast, to crunching, to groove filled, to melodic, many times within the span of just one song. Thus the album is always exciting to listen to. It makes you want to hear songs again and again. And, each listen will reveal a new and exciting part of the music, one you may not have noticed before. While every song here is excellent; there are a couple that really standout. "New Light" (the first video off of the album) is filled with a driving and jazzy tempo, and is highlighted by one super-cool bass break that gives it a very fresh sound. The thundering title track pummels from the very beginning and only seams to gain more vicious strength. An almost industrial sounding opening to the killer "An Ever-Expanding Human" leads to a song that is sure to have you and the pit moving. While, the speedy "Mind Alone" will pummel you, as if someone took your head and smashed against concrete repeatedly. Unquestionably original and complex, this is a must have for fans of technically superior death metal or those looking for something fresh, heavy, and different.. The Infinite Nothing is, in actuality, everything! I hope that you are all enjoying your Memorial Day Weekend. And, remember amidst all the barbecues, drinking, and fun to take time to remember those who have given their lives for our freedom. Also, this is my birthday today, and I am just taking it chill, for now. Take care and stay safe, my friends.